I know that my pups loved this food, as they both licked their bowls clean! They would both give it 5 paws up! I also love the fact that with Chewy.com, I can order food, toys and treats online and have them shipped right to my door! Their website is very easy to navigate with lots of fun products. The majority of their products are priced the same or lower than at the local stores, plus shipping is free with orders over $49!! (Orders less than $49 pay a flat-rate $4.95 for UPS Ground). Added bonus; products are shipped quickly to your door and you don't have to fight the crazy store crowds! 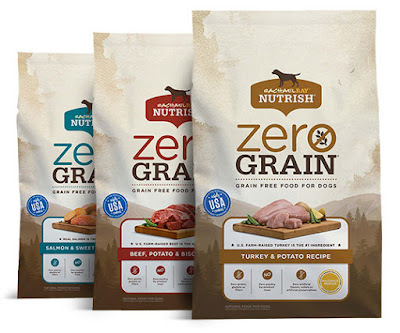 Give your favorite four-legged friend the best of everything life has to offer with Rachael Ray Nutrish Zero Grain recipes. These recipes contain real and farm-raised meats as the first ingredient. Wholesome, highly digestible fruits and vegetables are added, including sweet potatoes for fiber and antioxidants, tapioca and peas for essential carbohydrates, and cranberries for a natural source of vitamin C that helps support her immune system. And of course it’s made with no grains, glutens or fillers, as well as no artificial colors, flavors or preservatives.